Our flight from Charlotte to Rome was as pleasant as any 9.5 hour flight could be. It was dark and quiet and I caught up on movies between naps. We landed at the airport just outside Rome at 9:30 a.m. The trip through customs was quick and uneventful. We found our rental car and were on our way. (I am traveling with my sister Dana and her husband Paul.) The drive to Lucca was about 3 hours. The speed limit of 70 km was largely ignored by Italians. Little vehicles kept whipping around us on the left at 160 km, or 100 mph; so close I could have reached and touched them. I did not, as it would have cost me a limb. I needed both arms to hold the sandwich I ordered when we stopped at Auto Grill on A11. It was flat bread stuffed with prosciutto and Brie, deliciously warm and melted. I also had a green salad with quartered boiled eggs and tuna. Not canned tuna. Real, fresh, flaked tuna. It came with extra virgin olive oil, green and flavorful. The Auto Grill is a sort of truck stop, only it’s clean and sparkling and served fresh local fare. The U.S. could take a lesson from Auto Grill. I did not think of serial killers at all until I realized there weren’t any suspects in the Auto Grill. American truck stops are crawling with murderers. One has only to look around and count them. That last paragraph established my need for therapy. I move on. We passed fields of sheep, lambs and pigs. Olive groves, vineyards, rolling hills. 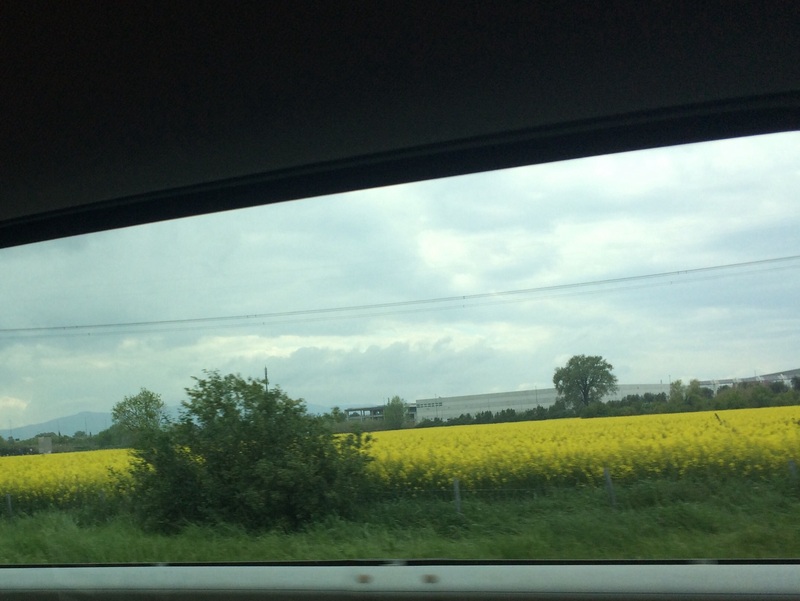 Great fields of mustard blooming lemon yellow. Crumbling, ancient homes and barns between modern apartment buildings. The terrain and color was much like California after a rain. (With a bunch of ancient stuff thrown in.) I marveled at the walls of Lucca when we arrived. I hadn’t thought of “walls” as pedestrian boulevards 40 feet wide, lined with street lights and giant chestnut trees. The walls are beautiful and form a three mile ring around the old city. We found the parking lot called Cittadella. The instructions on the pay machine were all in Italian. After 20 minutes of pushing buttons and guessing at the order of the processes we were rescued by a fellow from metro transit. (The instructions were not intuitive, the Italian woman in line behind us couldn’t work the machine either!) The transit guy explained the machine and showed us the phone number to call regarding monthly permits. We paid for 24 hours and began dragging our luggage down Corso Guiseppe Garabaldi toward our quaint street, Via Della Mano. We found our building. It was love at first sight. To be continued….